This Ain’t Your Father’s Lander! Brian Rubin: Thank you for taking the time to answer my questions. First off, where did the idea or inspiration for Blackspace come from, and how did it go from an idea into an actual, playable game? Volga Aksoy: The idea was something Jerry was toying with, where he had a lander prototype hooked up to be controlled using the Xbox 360 gamepad in Maya. Yes, that’s right in Maya. At the time, he was using a replica model of the one used in the Apollo missions, which was provided by another friend, and he was trying to see how feasible it would be to have something like the lander tether an object around in 3D. I personally am an avid simulation fan of almost all kinds with a particularly interest in helicopter simulations. So needless to say, when I saw the control mechanics in action, I immediately jumped at the opportunity to help out and see if we can make the craft’s controls more manageable. At that point, Jerry quickly dropped Maya, and moved over to XNA, since XNA made it much easier to get some custom game logic running on the fly. Even though I wasn’t “officially” helping him out, I was feeding Jerry with some little bits and pieces of tech info, like suggesting which physics engine to use, and how he could potentially get some rendering tech going on the side. Before I knew it, I was helping out Jerry like it was my primary mission to get this thing going. By the time we officially started to work together, Jerry already had a spherical asteroid with crates flying about in orbit along with a lander for the user to control. After we started working together on it, we quickly started to prototype some basic flight mechanics along with a proper chase cam that allowed the user to properly track the lander interaction. From there, things evolved rather rapidly, Jerry began creating designs for RTS systems and base management, while I focused on framework and systems implementation. We announced the company in February of 2012, that was seven months ago. Brian: Now tell us about the universe that Blackspace takes place in. For example, why and for whom are we mining those asteroids out in the blackness of space at great risk and expense? Jerry Phaneuf: As with most pieces of the game, the story is under construction. But I can give you a bit on the general plot. It revolves around a territorial dispute between a gigantic mining company and a powerful earth government called PREAA. These are the only two groups currently capable of reaching the asteroid cluster. The asteroids have unique properties including extreme density and gravity as well as large quantities of rare elements. Collier Industries, despite the threats from PREAA, continue to hire contract miners willing to take the risk, that’s you. The story will have compelling characters who have their own personal takes on the situation developing among the asteroids and back home on earth. There is also the reclusive character of John Collier himself, sole owner of Collier industries. You’ll learn what he is after and why he is willing to defy PREAA despite the mounting opposition. Brian: What kind of gameplay modes will be available to the player in either single or multiplayer capacities? Will there be a story-based campaign or a more dynamic campaign, for example, or skirmish modes? Will the asteroids you play on be randomly generated or more static creations? Jerry: We are setting out to release a story driven, hand crafted single player mode, where each asteroid brings a new challenge or a chance to prove your expertise. This is not to say that the entire story mode will be linear. There will be opportunity to explore random asteroids, establish extra bases to increase your income. The story is also where the user will find out why they are being paid to mine the asteroids in the face of such resistance. We plan to also release a more free form skirmish mode with the base game where players can test their skills and compare stats with friends online. We have been asked many times about a more random sandbox mode for the game and it is something we are considering as well. Another thing we are considering the possibility of runtime procedural generation of asteroids though it is not currently our focus. Our current goal is to create hand crafted levels/asteroids that are visually stunning and meticulously tuned. We want to make sure that the game scales in difficulty appropriate to your skill. As for multiplayer, this is something we would definitely like to do, it is listed in our stretch goals on our Kickstarter page. We are extremely excited about adding this to the game and are hoping we do well enough on Kickstarter to be able to add it. But even if we don’t get to it in this release, we plan to expand the game and add this in the future regardless. Brian: It looks like you’ll be able to manage multiple asteroids and their bases, and also mentions research, which to me denotes a larger meta game of sorts. Could you give us some more details about how these elements affect the immediate gameplay for the player, and how much control of the larger universe (i.e. an entire asteroid field? A solar system?) can be manipulated by the player? Jerry: Throughout the story your influence among the asteroids will grow. You will establish fortifications and work to setup permanent installations. Your funds will be affected by the function and efficiency of the bases you’ve established. Research unlocks upgrade paths, and upgrades allow you to do things like heighten efficiency, make powerful weapons, and enhance your sensors. You can invest your funds in multiple research paths, depending on how you prefer to play the game. Our stretch goals include a more free form game mode, where you travel among asteroids at will, creating and maintaining bases. The goal is to dominate and fortify the entire cluster in whatever way you choose. Using your supply ship sensors, you will investigate different asteroids and establish a sprawling supply network and squeeze out the opposition. Brian: There also appear to be role playing elements, as your Kickstarter video states that buildings can level up the longer they survive and do their job. Could you give us some more detail on how this works? Does your lander also have level upgrades? Volga: The underlying idea here is that we want the players to invest their efforts in their structures’ survival more than just the structures’ material value. We are investigating different ways to implement this system. It will likely involve humans assigned to the structure raising in skill level. When the structure is destroyed so are those who control it. Lander upgrades will be unlocked for purchase once certain research paths are traversed. For example, you may research a mining path and unlock upgrades that allow you to vaporize and collect minerals on the spot, or dig faster. You could also go down the military path and retrofit your mining charges with weapons grade explosives. Brian: Speaking of the lander, please give us some detail on how the lander is controlled and what some of its capabilities are. For example, what are some of the upgrades you can place upon it to make it a more effective weapon or building platform? Is there more than one lander to choose from? Jerry: The lander is a purpose built mining craft which is initially equipped with tools that allow it to dig, and do heavy lifting. Research and upgrades will determine what the landers future capabilities are. As you modify your vehicle it will change visually as well as handle differently. Each upgrade is a physical change and will be accounted for in the physics system. Don’t expect to drape it with armor and not upgrade your lift engines unless your not in a hurry to get anywhere. Brian: There’s mention of defense in your description of the game, but not much on offense. Will you have the opportunity to go on the defensive and attack the bases of your enemies, and if so, how will that be accomplished? Do you call your dropship in to drop troops for an assault, for example, or do you build your troops and lead them into battle yourself? Jerry: Your mission is to mine the asteroids. You may have military grade defenses if you choose, but are not being paid to attack (usually). You have a contract to mine specific elements and call for extraction. While it is possible to bring the fight to the enemy, it will most likely have more cost than benefit. You will have loosely controllable units, but none that are offensive. Units under your command are purpose built for mining tasks and in some cases defense. Brian: Moving onto more technical matters, the engine for this game looks pretty impressive, especially in its ability to allow the player to manipulate or destroy the surface of huge asteroids. The incremental damage to buildings shown in the video also looked impressive. What details can you give us about the engine you’re using and its capabilities? Volga: Blackspace uses a custom in-house built framework that relies on a modified version of Xen for rendering and BEPU for its physics, both of which sit on top of the XNA API. We built the game’s tech from the get go knowing that we wanted focus on mining as our primary objective. 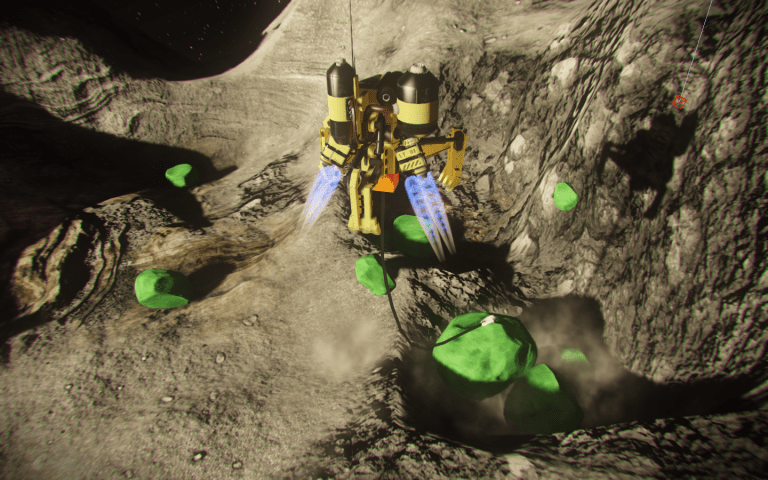 Allowing the player to engage in hands-on mining means ground deformation, and ground deformation means the game needs to support completely dynamic lighting. Let me expand a tiny bit on the lighting of the game. Our game utilizes a rendering pipeline called deferred lighting (or ‘deferred shading’ as some refer to it) which allows a game engine to treat all light sources as standalone entities in the scene. This means that any light in the game can be created, destroyed and moved in real-time with minimal overhead; compared to a more traditional real-time rendering engine. Once you combine this technique with high dynamic range lighting that is physically based to make sure that we can assign realistic values to our light sources, the results generated from the game require only a small amount of extra treatment to look plausible. While we already have a good deal of physics related gameplay, we plan to push it even more with destruction elements. We want to make sure that the game feels as dynamic as possible. For example, unlike traditional RTS games, the destruction taking place can have collateral damage. So if a flak-cannon blasts a flying enemy unit out of the sky and the pieces happen to land on another object, physics will determine how much collateral damage it does. This adds a realistic element to the action where you start to care about not just what kind of weapons to engage the enemy with, but also where you’d rather intercept them. Brian: Beyond the game modes mentioned earlier, will your game allow for any kind of modding support in order to give it more replay value? If not, why not? If so, what kinds of things will you allow players to create (i.e. asteroid maps, whole asteroid fields, campaigns, etc.)? How else might you support the game after launch in order to extend its life (i.e. expansion packs or DLC, etc.)? Volga: Modding is an interesting aspect of games that actually have some symbiotic benefits for the end user as well as the game developer. That said the initial overhead for adding modding support for the developer is that it requires careful architectural planning of the game’s asset pipelines as well as the code base and content creation tools. If we were to commit upfront to shipping with modding support in our game, then this would push out our release date. Instead, we would like to bring our game to the end-users as early as possible. Once we release Blackspace, then depending on our end-user feedback, we would be more than happy to add these features into our game to extend its shelf life. Brian: Finally, if there’s one thing you’re most excited about regarding Blackspace that you could share with potential fans (and hopefully, Kickstarter backers), what would that be, and why? Jerry: I think I enjoy the fact that it is something new. Sure it incorporates many elements from other games, but in summation it becomes something all it’s own. It’s really exciting to see something like this emerge. I’ve always loved strategy games, but was never able to connect with them the way we are able to in Blackspace. Here, you are a part of the world in the action and in danger. The environment isn’t just a series of set pieces that are static, they are dynamic and malleable. The game reacts to your input in a very visceral and natural way.